Leather cleaners Doncaster ,You have found us! A highly trained family firm living and working in Doncaster we offer an excellent service. Work that is second to none and all at terrific value. It is so important to use the correct products to clean and protect your leather sofa. The first thing we do is to check through the microscope what leather you actually have. We only use use the very best products on your leather sofa or leather goods. And we can also advise you on what products to buy to protect your leather investment. There has been leather cleaners Doncaster for millennia going back before roman times here in Doncaster, and with the equine connection there has always been a demand. These days leather furniture has never been so popular. People are beginning to realise that the leather wipes the man in the shop told them about are a waste of time and can actually damage your leather sofa. We offer a free survey and inspection of your leather and we will tell you exactly what can and can’t be done. We start with a leather deep clean and if you have cat scratches or cuts, we can repair them for you too. 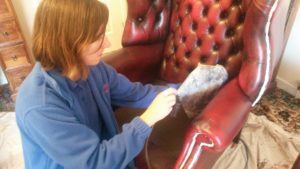 Tanneries, the people that produce leather for furniture etc advise that your leather sofa should be deep cleaned and re finished once or twice a year depending on the conditions and the use. We say that in our experience once a year will be sufficient. The danger with leaving it longer comes when the leather cracks and starts to fade in the sun. We can keep on top of this for you and you can look forward to keeping your leather investment for many years to come. So when you are looking for leather cleaners Doncaster just give us a call. We only serve Doncaster so we are never very far away. We can pop in and give you a free survey and some free advice about caring for your leather sofa.